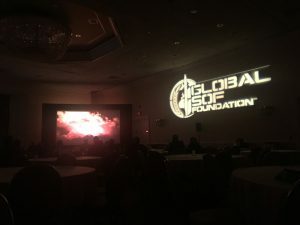 The second day of the Global SOF Symposium featured service dog demonstrations, some schooling on the human brain, and an emotional 78-minute documentary featuring former Green Berets. Many relationships were fostered, companies were showcased, and we might have even learned a thing or two. We started the morning with a Corporate Partner-only breakfast, and we’re not talking Fruit Loops. As the members of our Partner companies dined on eggs, bacon, fruit, and muffins, they were privy to a short briefing to learn about opportunities to get involved with Bold Quest, a coalition demonstration focused on interoperability. After a quick networking break, sponsored by Fluor, we started our SOF Slams. SOF Slams are modeled after the TED Talk format, so they provide quick insights into SOF-related topics from dynamic speakers, and we sandwiched lunch with two on each side of it. The first was very interesting (and a little scary), coming from Rick Elder from BeyondClothing. 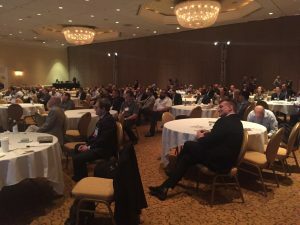 He spoke about the oft-ignored Arctic Cap and the implications of its impending disappearance, tying it all back to the innovative arctic gear that his company is developing. He was followed by Dr. Erik Won, who is currently studying innovative technology that he initially compared to “witchcraft,” but became a believer after a double-blind study showed a 60% reduction in symptoms in Traumatic Brain Injury (TBI) and PTSD sufferers. After lunch, we welcomed Mr. Mark Moen to the stage, where he used his thirty minutes to educate us on the possibilities within US Security Assistance. He noted the importance of knowing the regulations, saying that “when you tell a lawyer that FMS money doesn’t expire, they don’t understand that.” We moved from money to service dogs, bringing up Ms. Carol Borden and Elvira, her 8-year-old service dog. Ms. Borden spoke passionately about the support that her service dogs have provided to veterans, saying that the 200+ dogs that have been donated to those with “invisible” disabilities across the country have prevented suicides and improved lifestyles. She and Elvira went on to invite some audience interaction as they demonstrated the dog’s capabilities. The evening was highlighted by a screening of the Legion of Brothers—a documentary produced by CNN, and this was its first public screening since its premiere at Sundance. There really are no words to describe the film…it was emotional and thought-provoking and people in the room could barely look away. To make the evening even more special, we rounded it out by bringing producers Tresha Mabile and Peter Bergen, along with Mark Nutsch, Bob Pennington, and Scott Neil, who were featured in the film, to the stage to answer questions from the audience and discuss the movie’s making. 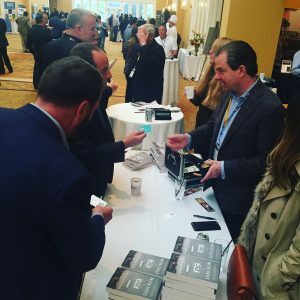 It was another impressive day at the Global SOF Symposium, and we’re excited to see what tomorrow brings!